Last week, 15 taxonomic experts for DiatomBase got together for the first time, during a LifeWatch-WoRMS sponsored workshop. This get-together is the official start of DiatomBase, a world register of all marine, non-marine, recent and fossil diatom species. 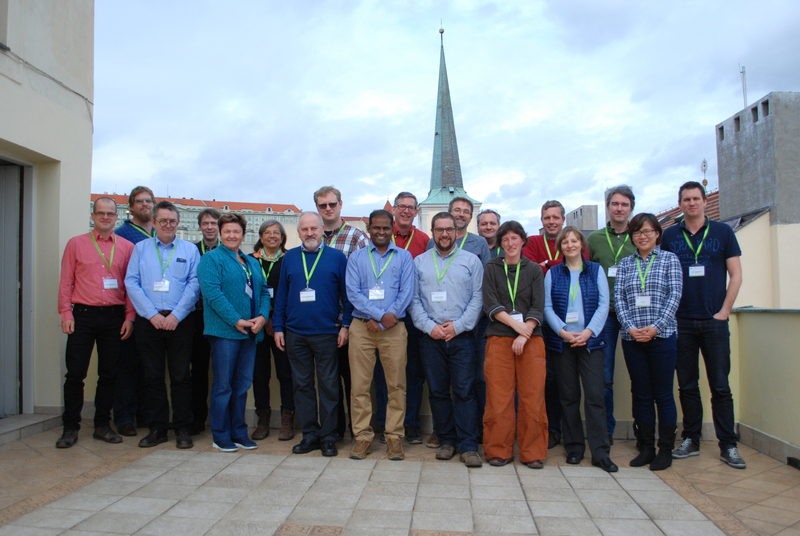 The Diatom experts had their first workshop in Prague – from 20-22 March – which was organized back-to-back with the 11th Central European Diatom Meeting hosted by the Czech Academy of Science. This workshop is the first in a series of four in 2017, their organization made possible through LifeWatch funding. Of the total group of 20 taxonomic experts from all over the world, 15 got together for the first time to learn about the Aphia database system and how it will be used to host DiatomBase. Next to an introduction to the online input interface – given by the WoRMS Data Management Team - there was plenty discussion on how things could move forward and who will take responsibility for certain tasks. In addition, priorities and deadlines were set, aiming at the official launch of the DiatomBase portal during the upcoming 11th International Phycological Congress, which will take place from 13-19 August 2017 in Szczecin, Poland. The diatom information within this register is a compilation of information from several sources, including The Catalogue of Diatom Names (previously hosted at the California Academy of Sciences, CAS), AlgaeBase and the European Register of Marine Species (ERMS). Currently there are over 75,000 names in DiaotmBase. After the compilation and integration of all these sources, this group of 20 diatom experts will now take over and make sure that DiatomBase gets updated and completed. During the workshop, the PhycoBank initiative – a system to register nomenclatural acts for diatoms was also presented, and possible future collaborations between PhycoBank and DiatomBase were discussed. The DiatomBase initiative is supported by LifeWatch Belgium, part of the E-Science European LifeWatch Infrastructure for Biodiversity and Ecosystem Research. LifeWatch is a distributed virtual laboratory which is used for different aspects of biodiversity research. The Taxonomic Backbone of LifeWatch aims at bringing together taxonomic and species-related data and at filling the gaps in our knowledge. In addition, it gives support to taxonomic experts by providing them logistic and financial support for meetings and workshops related to expanding the content and enhancing the quality of taxonomic databases. Front (L to R): Jakub Witkowski – David Williams – Thelma Ludwig – Andrzej Witkowski – Balasubramanian Karthick – Carlos Wetzel – Leen Vandepitte – Marina Potapova – Liu Yan. Back (L to R): Jonathan Taylor – Wolf-Henning Küsber – Silvia Sala – Maxim Kulikovkiy – Pat Kociolek – Wim Decock – Luc Ector – Bart Van de Vijver – Koen Sabbe – Bart Vanhoorne. Image by Jakub Witkowski.